NASA's three Great Observatories -- the Hubble Space Telescope, the Spitzer Space Telescope, and the Chandra X-ray Observatory -- joined forces to probe the expanding remains of a supernova. Now known as Kepler's supernova remnant, this object was first seen 400 years ago by sky watchers, including famous astronomer Johannes Kepler. The combined image unveils a bubble-shaped shroud of gas and dust that is 14 light years wide and is expanding at 4 million miles per hour (2,000 kilometers per second). 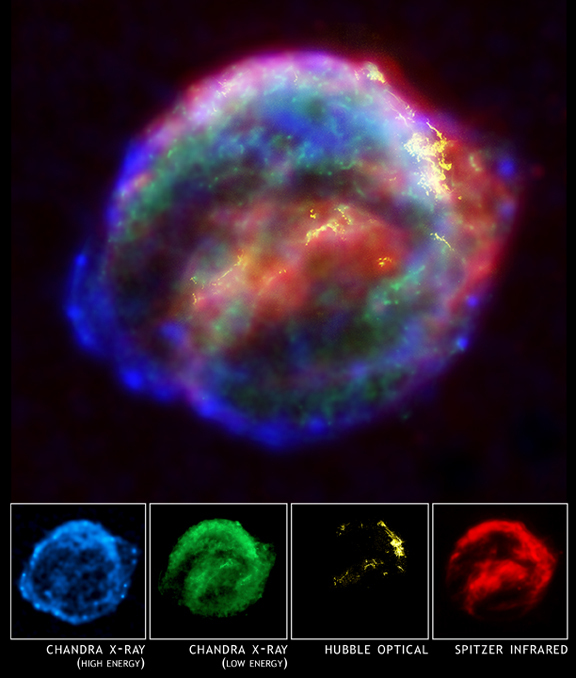 Observations from each telescope highlight distinct features of the supernova remnant, a fast-moving shell of iron-rich material from the exploded star, surrounded by an expanding shock wave that is sweeping up interstellar gas and dust. Each color in this image represents a different region of the electromagnetic spectrum, from X-rays to infrared light. These diverse colors are shown in the panel of photographs below the composite image. The X-ray and infrared data cannot be seen with the human eye. By color-coding those data and combining them with Hubble's visible-light view, astronomers are presenting a more complete picture of the supernova remnant. Visible-light images from the Hubble telescope (colored yellow) reveal where the supernova shock wave is slamming into the densest regions of surrounding gas. The bright glowing knots are dense clumps from instabilities that form behind the shock wave. The Hubble data also show thin filaments of gas that look like rippled sheets seen edge-on. These filaments reveal where the shock wave is encountering lower-density, more uniform interstellar material. The Spitzer telescope shows microscopic dust particles (colored red) that have been heated by the supernova shock wave. The dust re-radiates the shock wave's energy as infrared light. The Spitzer data are brightest in the regions surrounding those seen in detail by the Hubble telescope. The Chandra X-ray data show regions of very hot gas, and extremely high energy particles. The hottest gas (higher-energy X-rays, colored blue) is located primarily in the regions directly behind the shock front. These regions also show up in the Hubble observations, and also align with the faint rim of glowing material seen in the Spitzer data. The X-rays from the region on the lower left (blue) may be dominated by extremely high energy electrons that were produced by the shock wave and are radiating at radio through X-ray wavelengths as they spiral in the intensified magnetic field behind the shock front. Cooler X-ray gas (lower-energy X-rays, colored green) resides in a thick interior shell and marks the location of heated material expelled from the exploded star. The remnant of Kepler's supernova, the last such object seen to explode in our Milky Way galaxy (with the possible exception of the Cassiopeia A supernova, for which ambiguous sightings were reported around 1680), is located about 13,000 light years away in the constellation Ophiuchus. 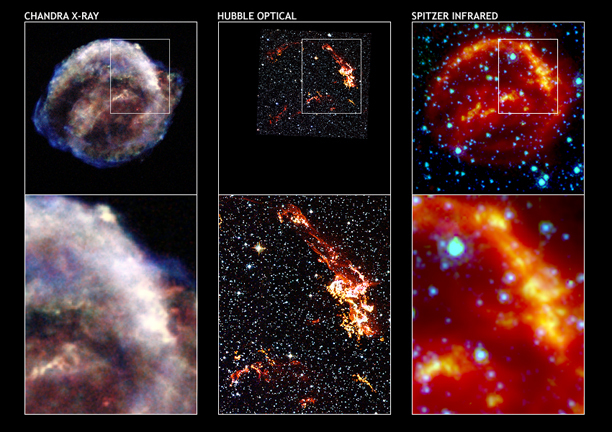 The Chandra observations were taken in June 2000, the Hubble in August 2003, and the Spitzer in August 2004.